For a list of food items, see Food. Cooking is a crafting method that produces food items from ingredients. Players can do basic cooking at a campfire or similar station, or prepare meals from recipes at a kitchen counter or similar station. 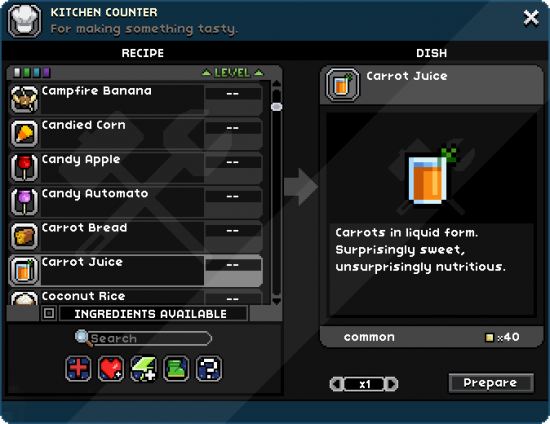 Players begin with unique recipes based on their race. Each race begins the game with three to five recipes that reflect its culture or biology, and is able to learn other races' recipes later. As the game progresses, more complicated recipes can be learned that can provide better buffs. Materials used in cooking include crops, meat and other materials. To unlock the full benefits of some foods, they must first be cooked. These are used to cook mainly single food items, such as Raw Steak into Cooked Steak. A list of recipes for cooking at a Campfire and other meat cooking stations can be found here. These are used to make most foods with multiple ingredients. A list of recipes for cooking at a Kitchen Counter and other Meal Prep Stations can be found here. This page was last modified on 19 July 2017, at 22:09.